The EBU have announced that Erik Skoglund's defence of the EBU-EU lightheavyweight title against Stefano Abateangelo (18-3-1) will go ahead September 13 in Copenhagen. It's a mandatory defence by the undefeated Skoglund (20-0). 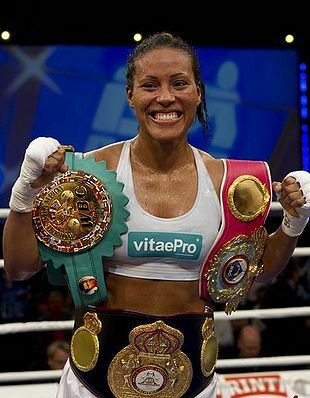 In the co-headliner WBA; WBO and WBC female welterweight champion Cecilia Braekhus (pictured) will reportedly defend the titles against Croatian Ivana Habazin. The undercard is likely to feature a rare all Norwegian matchup when supermiddles Tim-Robin Lihaug (7-1) and Simen Smaadal (8-0) clash and superlightweight Anthony Yigit will again take on Kasper Bruun in a classic Sweden vs Denmark matchup. Sauerland Promotion have yet to officially confirm the date and site. vacant IBO female welterweight title, scored 96-94 and 97-93 for Retzke and 96-94 Muthoni. Spanish featherweight title, scored 98-91, 97-92 and 96-93. Both men came in just a little over 126 lbs but it was agreed to let it pass.